Almost six hours from the start of the race, after three near falls and one good dirty one, a serious cramping on my inner right thigh (oddly, this is where I had a cramp at mile 21 of the Napa Valley Marathon), and plenty of time to enjoy the forest and surrounding redwoods, I ran through the finish line. I have never felt more exhilarated to finish a run. This was the first endurance event I’ve done after trying to become “fat-fueled”. I followed Vespa’s OFM protocol. Because of this, I’ll post how I specifically implemented it, pre-, peri-, and post. The two most noticeable differences were that my reliance for fuel was curtailed due to the increased reliance on plentiful body fat for fuel and the fact that I never experienced a bonk or an energy low. In fact, there were several stretches where I felt like the energy flow was just about perfect. The question, always, is whether that perfect energy flow is something that I can generate more consistently throughout my next event. 70 minutes before: 2 big glasses of water, coffee, 1.5 Tbsp. Artisana raw organic virgin coconut oil, 1 Tbsp. Organic Valley‘s Pastured Butter, 1 Vespa CV-25, 10 Sunfoods chlorella tablets, and 1 8 oz. container of Pacific Foods Vegetable Stock. 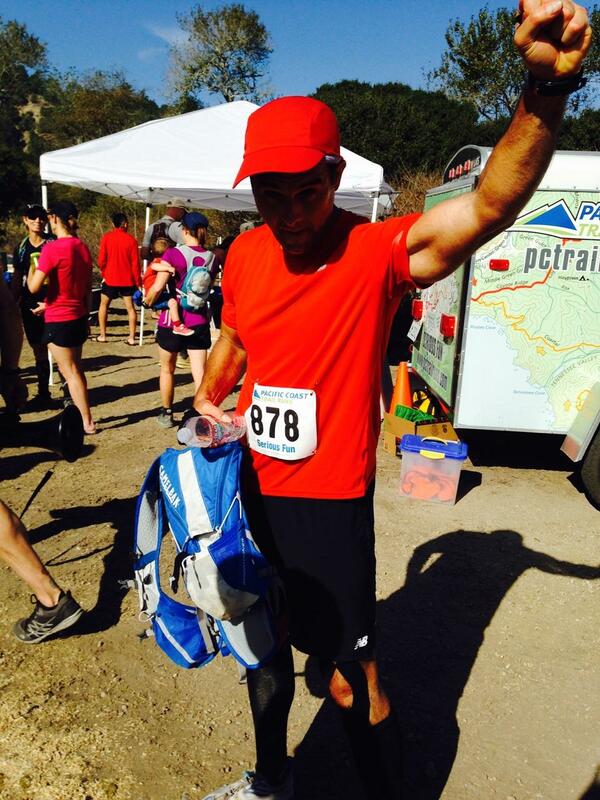 I wanted to make it through by relying on aid stations to replenish my water. I did not eat anything from the aid stations. 60 minutes in (and subsequently repeated each hour from then): 1 Hammer Anti-Fatigue Cap and 2 BlueBonnet BCAA pills. Almost six hours from the start of the race, after three near falls and one good one, a serious cramping on my inner right thigh (oddly, this is where I had a cramp at mile 21 of the Napa Valley Marathon), I ran through the finish line. Afterwards, I had an orange and some watermelon, an organic active greens bar, and lots of water. Hobbled over to the ocean and stood in the freezing Pacific for 15 minutes. Next post: gear and lessons learned! This entry was posted in 50K, endurance Training, Fueling and tagged 50K, endurance training, fat-adapted running, fueling plan, keto-apatation, OFM, Pacific Trail Runs, running, Skyline to Sea Marathon and 50K, superior performance, ultramarathon, Vespa on October 14, 2014 by Leo Garcia.